Welcome to Morton Falls Publishing Company. The Look For Me books are getting great reviews and five star ratings around the country. For additional information about the book series including many interactive tabs, please go to www.LookForMeIWillFindYou.com. Be sure to read the back story, leave a note in our guest book, answer our survey and give us a shout-out. The posters are great for decorating your shop wall, or hanging in the house or dorm room--add some color and remind yourself to Live Life Be Free. We had a great time shooting the photos and hope that you enjoy them as well. We are working on the next project now, so re-visit again. 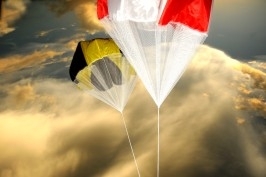 We also manufacture the most unique nylon parachutes and deployment systems in the industry. Please browse through our store and shop with confidence. We invite you to create an account with us if you like, or shop as a guest. Either way, your shopping cart will be active until you leave the store. Please note that in some cases our prices are for sets of parachutes and streamers so your money goes further and your landings are softer. Let us know what you think and check back often for new items. Thanks and keep flying, keep living free. Copyright © 2013-2019 Morton Falls Publishing Company. All rights reserved.